Canuck Quilter: Thanks for sharing! Every now and then I wonder why I keep writing patterns. I'm sure my very supportive husband has also wondered when I treat him to rants about a design I really like not finding traction out in the wide world, or about being so tired of that pattern I've been working on forever (love the quilt, but the pattern isn't flowing as it should yet) or about that last magazine rejection. Then, to balance things out, every now and then I also get lovely messages from quilters who have made quilts with my patterns and kindly share pictures of their creations. They truly lift my spirits and encourage me to keep working. Anita in Ottawa shared her beautiful version of my Spring Blooms quilt (I shared the block tutorial here). I love seeing alternate versions of my designs. Anita chose very different fabrics and chose a straight setting instead of an on-point setting. Same blocks, very different quilt! I'm very late sharing this picture. Anita sent me this last spring and I saved it in the wrong folder and couldn't find it again. I'm so glad I finally stumbled into the correct folder! Mary M. made Geese Across the Table placemats. I love her color choices. She chose to make them less scrappy than mine and I think that worked out very well. Mary also made a version of Tic Tac Who? for her grandchild, choosing to make the puppy a Labradoodle like the family dog. Works for me! 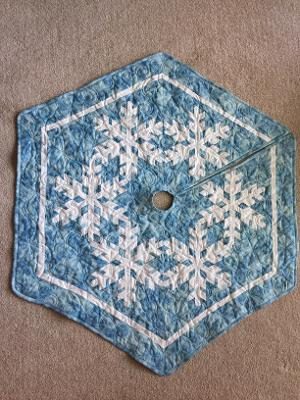 Here is Sue Zimmerman's Snow Dreams tree skirt, which she finished in time for Christmas. It was her first ever paper pieced project! Nothing like jumping in with both feet, but she did a fabulous job. Nancy Troyer quilted it for her. 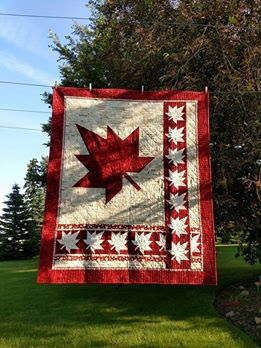 And Marilyn F. shared her Canada 150 quilt. 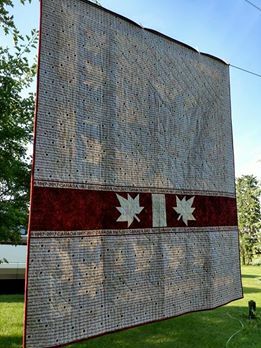 Check out the fun pieced back as well, with a pieced label about her participation in both Canada's 100th and 150th anniversary celebrations. Thank you for sharing and for the encouragement, ladies! I'm off to work on a new pattern! I love your designs, and can only imagine the frustrations of being a designer! Your patterns are the perfect template for others to explore there creativity. I'm sure it is gratifying to see your designs being made up. And, of course, there are probably so many more that don't send you pictures! They are lovely. It's just the BEST feeling (and I've been privileged to feel it a few times) when someone makes your pattern and takes the time to send you a photo. These are wonderful renditions. What a delight to see your patterns come to life in the hands of other quilters! Congratulations! Don't get discouraged. Design patterns for YOU. If you like them and make them, then your goal is met. When others like them and choose to make them, it's icing on the cake. Enjoy the process! Joanne, your patterns are the best. So easy to follow, regardless of the skill level of the quilter. I look forward to your next great pattern. Your patterns are so fun and I love seeing how others make them into beautiful quilts!